Home > Causes of Back Pain > What is Spinal Muscular Atrophy? Spinal muscular atrophy is a rare genetic disease that affects the motor neurons, the specialised nerve cells that connect with muscle cells to bring about movement. It causes the muscles to become very weak and in its most severe form causes early death in babies born with the condition. In other people, its effects are relatively mild and it is only diagnosed in adults. The muscles that support the spine are affected, so it can have progressive effects on the spine in later life, causing stiffness, back pain and lack of mobility. Diagnosis is made by a genetic test that looks for specific mutations in the SMN gene. Only very rarely is spinal muscular atrophy diagnosed if there is no detectable abnormality in this gene; in these cases, specialists make the diagnosis by looking at muscle biopsies. 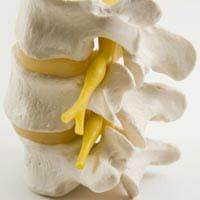 The nerves that are associated with the spinal cord are particularly badly affected and there is no link between the muscles attached the spinal cord and the brain, so the person develops stiffness and difficulty moving. Speech can also be affected as the muscles that operate the jaw and mouth cannot get the signals they need from the brain to work properly. In the mildest type of the disease, the affected person can find it increasingly difficult to walk and the balance is also affected, making falls and injuries a real danger. Many children and adults even with the mild form of the disease tend to develop curvature of the spine – a condition known medically as scoliosis. As the spine curves more, this may affect the muscles in the chest and breathing can become difficult. Children with the mild form of the disease can go to school and mix with other children but it is important for a child to do regular exercises, as given by a specialised physiotherapist, to minimise the effect of the muscular weakness as much as possible. Most physiotherapists are keen to encourage children to do a lot of swimming as this strengthens the muscles without risking injury in falls, and supports the body as the child is exercising. Adults who have spinal muscular atrophy do not have any mental impairment and can lead full and active lives if they get adequate support. If their mobility becomes affected, using motorised wheelchairs, computers to communicate and interact with others and splints and supports for their skeleton can help. Motor neuron diseases of various types are the subject of intense research programs. It is possible now for parents who know they are carriers of the genetic mutation that causes spinal muscular atrophy to have a genetic test done on an unborn child at about the 11th week of pregnancy. As the disease can be exceptionally severe and, if not fatal, produce profound disabilities, genetic counselling is important to enable parents to come to a decision about whether to go ahead with the pregnancy. Very recent research at Sheffield University in the UK has been looking at whether it will one day be possible to treat spinal muscular atrophy using a single gene replacement technique. At this point, the research is still being carried out in mice and has not yet reached the stage of human clinical trials. It is still creating a lot of excitement as, if it works, it will mean an effective treatment for SMA that can be given by a single injection.